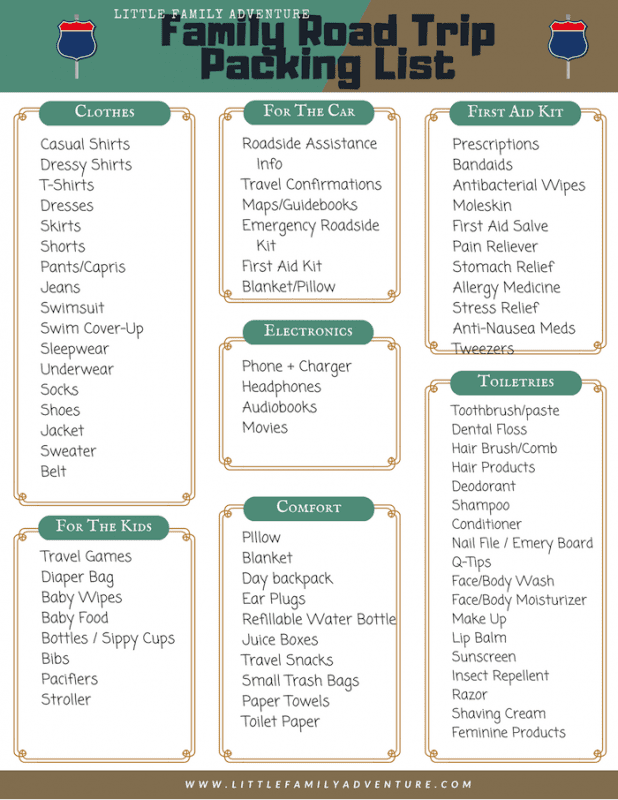 I am partnering with Tree Top to bring you these family road trip essentials and printable packing list. It is prime travel season and many of you are starting to plan out what you’re bringing. Having just returned from a road trip to Dallas, I thought now was a great time to talk about what to pack for a road trip. Dallas is a short three hour drive away. Whether we’re driving for a few hours or making a cross country road trip, we pack the same things. The only difference is there are more clothes the longer we are away. This list of road trip essentials is all about keeping you comfortable during your trip. If you are comfortable, then it stands to reason that you’ll be happy during the drive and arrive at your destination in great spirits. There are plenty of travel games on the market. 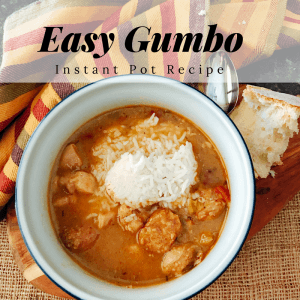 Bring family favorites that will make the time pass quickly while you are having fun. 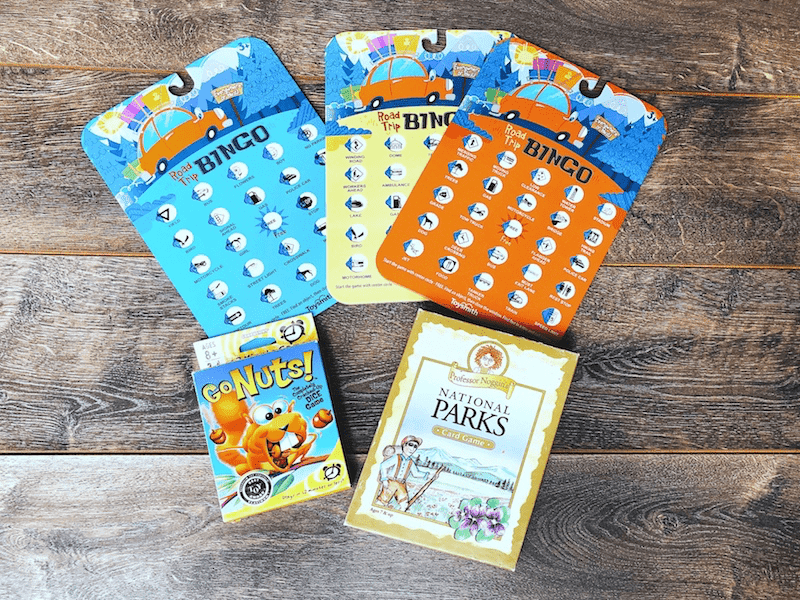 Some of our favorites include Travel BINGO, Professor Noggins National Parks card game, and Go Nuts! dice game. No Pieces Required – One of our favorite road trip travel games is the Travel Alphabet Game. Starting with the letter A, spot something that begins with that letter and then move onto B, C, etc. One rule we made is that the object has to be a noun and something you actually see on the road. U-Z can get really entertaining! It’s all about comfort. Nothing sours a road trip more than waking up from a car nap with a crick in the neck. Bring either a travel pillow or small pillow for each person. This allows everyone to sleep comfortably without intruding on others’ space. Family Travel Tip: Having your own pillow in a hotel or while camping can also put you at ease and help kids sleep in a strange place. Cozy kids are happy kids. If your kids or you like to nap while someone else is driving, cozy up with a soft blanket. Napping passengers help make a quiet and more enjoyable ride. Plus a blanket can double as a picnic blanket if needed. This is the sweatshirt/hoodie, scarf, and backpack I travel with most often. Cooler nights, extra powerful air conditioning, or a change in altitude can warrant an extra layer. Having either a light jacket, wrap, or sweatshirt will keep you warm, comfortable, and happy. In the past, I used plastic grocery bags and they work well enough. But there were a few times that I’d pull a bag out and there would be a hole at the bottom. With kid messes, that’s never a good thing. So lately I’ve started carrying a roll of pet poop bags for trash. They are small and are super compact. A rubber band does a great job of holding the roll together and I just store in the glove box. For cleaning up spills and sticky hands, a roll of paper towels comes in handy. There are also handy during a mid day picnic. Just a good thing to have when you are traveling because there is always that one time……..
Snacks are road trips essentials. Avoid junk food on your trip by stocking up on healthier snacks for foods for the family. Fruit, nuts, Breakfast Cinnamon Cookies, trail mix, cheese, and yogurt are all great choices and favorites with all ages. Keep a soft sided lunch box with a freezer pack in the car to keep foods cold. One of the items we’ve been packing are Tree Top’s NEW Clear Apple Sauce Pouches. Until recently, I haven’t bought pureed fruit snack pouches because I couldn’t see what exactly was inside. 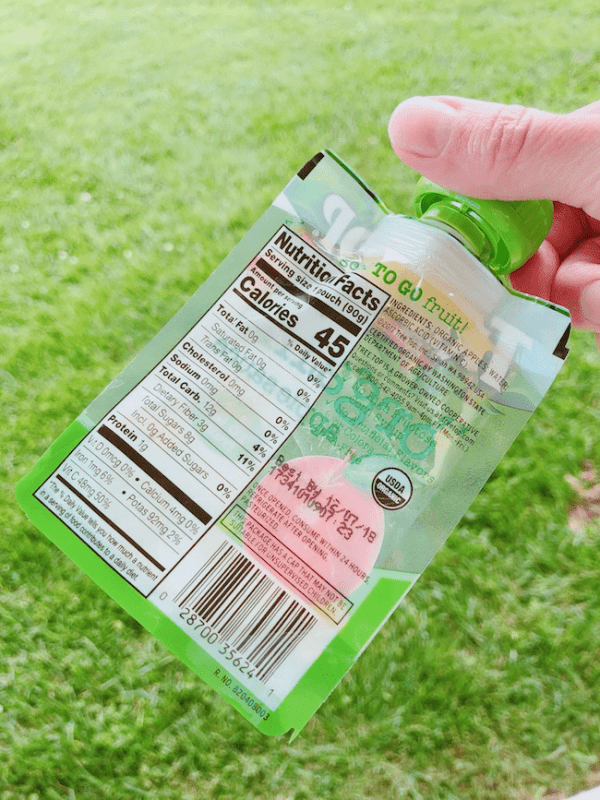 With Tree Top’s new clear pouch, there is no question because I can see through the packaging. Each pouch is real food ingredients with NO high fructose corn syrup, artificial flavors or colors. Their apples are 100% sourced in the USA too! There are six flavors to choose from including No Sugar Added Apple Sauce, Cinnamon Apple Sauce, Strawberry Apple Sauce, Mixed Berry Apple Sauce, Tropical Apple Sauce, and Organic no Sugar Apple Sauce. I really like a classic applesauce, so the Organic Applesauce is my favorite. But the kids go crazy for the Tropical Apple Sauce. Each is perfect for snacking on the go and are spill resistant for any family road trip. If you want to eat lunches on the road, pack a larger cooler in the trunk and fill with lunch items and more snacks. Hydration is key to good health. Bring a water bottle for each person so they can stay hydrated. Refill stations are easy to find or you can bring an extra water to refill your bottles. We often want something in addition to water. Instead of grabbing for a sugar laden soda or energy drink, we opt for fruit juice instead. Tree Trop’s organic apple juice boxes are an easy choice because they have no added sugar and come in convenient on-to-go serving sizes of 6.75 & 8 ounces. Just like their apple sauce pouches, the juice is made with 100% USA Apples and contains nothing artificial. Actually the juice is JUST juice. That’s it! Tip: You can freeze juice boxes the night before and enjoy them as a slushy the next day. Just cut the top off the box and enjoy with a spoon or thicker straw. It’s a nice pick me up on a hot day. Kind of a no brainer here on this one. If you have a cell phone, be sure to bring it and its charging cord. One is no good without the other. If you happen to forget the charger, ask the front desk staff at your hotel. They may have an extra they can lend you. Download your favorite book/series and listen in the car. It makes the time fly by. When the kids were little, we’d listen to Hank the Cowboy or Harry Potter. This last trip was Peter and the Starcatcher by Dave Barry and Ridley Pearson. 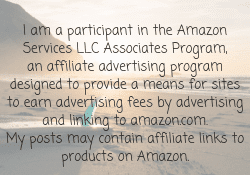 We download through our local library for free, but there are plenty of options including Amazon and Audible. An Ipad or laptop with movies is now a part of our family road trip essentials. I’m sure most families will agree. Download your favorite movies or get a few new ones just for the trip. If you have multiple electronic devices being played at once, bring headphones for all. That way there is no competition to hear what’s playing. It also provides Mom and Dad peace and quiet during the drive. Ear plugs are added here because they are always a good idea to tune out the noise. There are areas where there is NO cellular service and the GPS doesn’t work. So it’s best to have a back up so you don’t get lost. Print out a map of your route and bring that along. I use websites like RoadTrippers and Atlas Obscura which points out sites, points of interest, or attractions along your route and plan to stop at a few. This picture below is us snapping an picture of the Eye at the Joule Hotel in Dallas. Travel is about the journey and the fun memories you get to create along the way. Those unexpected stops can be some of the most memorable. When else can you say you viewed a three story tall eyeball or other random roadside attraction? This picture was from our trip to Deep Ellum in Dallas. I got the wild hair to go mural hunting and made everyone stop for photos. We even have our Tree Top Apple Sauce and Apple Juice with us. Stops along the way are great to grab a snack, stretch your legs, and explore a little. When traveling, I have always made it a point to dress the kids in brightly colored clothes. It makes it easier to spot your child when you are out of the car. Orange was (and is still) a favorite with my youngest son. But now I can’t recommend a bright color with a pattern enough. Dress kids in a bright patterned shirt or dress and pack an extra change of clothes in case the first gets dirty. Why a Bright Pattern? Last year when in Yellowstone, we lost my youngest son on the walking trails behind Old Faithful. Scariest 2 hours of my life! The same can be said for the other 4 families that lost someone that day. Everywhere we looked, we saw boys around my son’s age in an orange shirt and jeans. That’s the exact same outfit he wore. A pattern would have been easier to spot that day and now we dress in some type of a stripe or design in addition to a bright color. My kids have been out of diapers for quite a while. But a good rule of thumb is one diaper for each hour you plan to be on the road. 8 hours = 8 diapers. Bringing a few extra never hurt either. Better safe than sorry. This green day pack is super light and folded up into its own pocket for storage. When you get out of the car to stretch your legs or decide to explore once at your destination, use a day/backpack to store water bottles, sunscreen, and other stuff. It makes it easy to grab and store what you need so you can get up and go. We use a packable daypack that stores inside its own pocket making it super compact. Print off this family road trip packing list that will serve as your checklist with all the road trips essentials you’ll want to bring on your next family vacation. These are our family’s road trip essentials. No matter if the trip is short or long, these are the things that make the trip comfortable and result in happy passengers. It’s true that the journey is just as important as the destination. With this road trip packing list, we have everything we could need or want for the trip. Plus when we bring our own snacks and a light lunch, we save money too. So that means we can splurge on something else. Don’t forget that you can find Tree Top products at a local grocery store near you. Be sure to get our printable packing list and ensure that you know what to pack for a road trip. If you have a road trip essential not listed above, please let me know in the comments below.